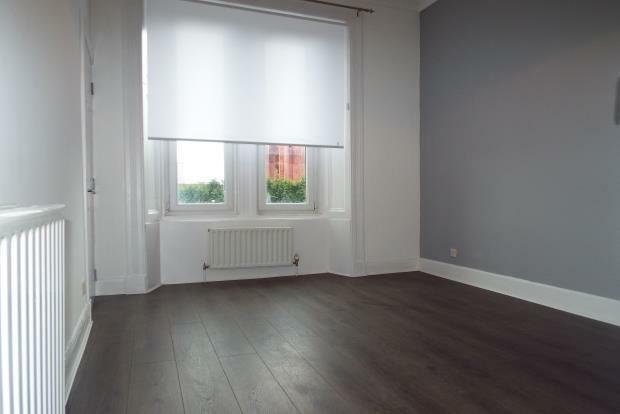 1 Bedroom Flat To Rent in Glasgow for £575 per Calendar Month. This is a stunning home situated on Cumbernauld Road. A nice traditional close takes you to the preferred first floor where you are met with this lovely flat. Enter into the hallway which gives access to all rooms. Through to the right is the newly refurbished living area, decorated in trendy grey and white and quality laminate flooring. Also in the lounge you have a brand new, never been used high gloss kitchen, fantastic use of space, lots of units and cupboards. There is also a utility cupboard with window which houses your washing machine with plenty room for more. Back through the hallway, the bedroom is larger than large, carpeted and ready for you to make your boudoir. Next door you have the bathroom with wc, basin and separate shower cubicle. The nearby vicinity has plenty of amenities, with Alexandra Park just a short walk up the road. A variety of shops with a bakery, convenience stores a chemist and the rest are just downstairs, while further down the road is the Parkhead Forge and Retail Park with everything you could need including cinema, supermarkets, retail outlets and much more.